I greatly enjoy clay as an artistic medium, having taken several classes on pottery–hand form and potter’s wheel–as well as sculpture. Pottery is one of my favorite hobbies. I look forward to exploring the evolution and variety of Greek ceramic techniques and how this can indicate changes in the culture and society. This stems from my passion for history and my introduction to archaeology under Susan McCarter this fall semester. 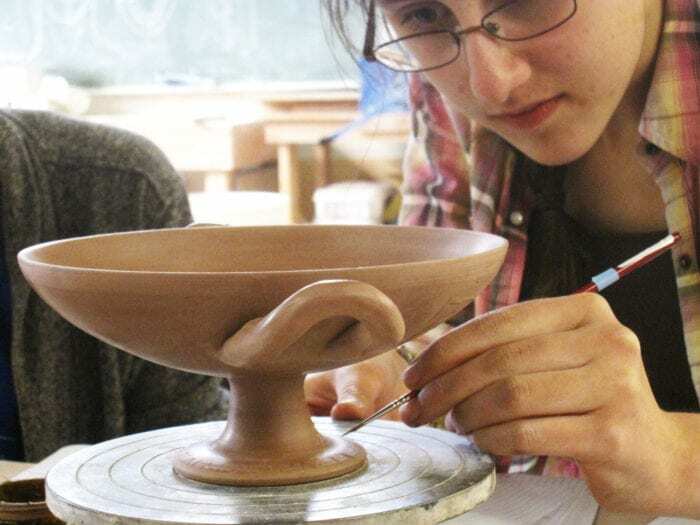 I am very excited to participate in this course for its hands-on approach in exploring the context of the artifacts as well as the methods of ancient Greek ceramicists. Sealing together the walls of the kiln using fire clay. We had a lot to cover at Clayworks with our kylikes and our kiln! We read selections on kiln construction for class, which is probably one of the most important aspects of our task to recreate ancient Greek vases. Our entire project depends on the success of our kiln. Eleni Hasaki establishes from the archaeological record the standard structure for a kiln, “updraft, and double-chambered.” The basic kiln had a firing chamber where the vessels were placed and a secondary fuel chamber. Air was allowed in through the base and out the top of the kiln. We also read Joseph Veach Noble’s conclusions on kiln technique and the hazards of firing. An experienced Greek potter could tell what stage the process was in by the colors of the flame in the kiln, they also used unfired clay with black glaze to signal stages of production. Furthermore, since Attic glaze does not melt, it was possible to stack vessels within the firing chamber, and the Greeks did. Anything from remaining moisture or air bubbles to uneven temperatures in the kiln can cause the pottery to explode! They built a small, circular, updraft model, intending to reproduce Noble’s three stage firing process. Their results indicated that it takes seven to nine hours, requiring approximately 100 pounds of firewood, and constant monitoring. A covering saggar box was added to protect the kylikes from ash and flame marks. Kahn and Wissinger concluded that, with a small kiln like theirs, a workshop could produce six pots per week. Our class divided time between completing the construction of the kiln and finishing up final decorating touches on our cups. With two tasks to complete, there was little room for error. Inside, groups worked feverishly to finish the decorations on this final painting day. Professor Balachandran brought in a super concentrated slip, to be used for relief lines. She had allowed the slip to evaporate for 5-6 days. Groups were able to produce a super fine line with the linierhaar though we struggled with the single hair paintbrushes. In the midst of our excitement and eagerness to finish painting, some of our handles broke off! This was very disappointing, but we are taking it in stride, looking forward to a future lesson from Professor Balachandran on how to use conservation materials to restore the handles to their original place. Anna Soifer puts the final touches on the painted inscription on the foot of a kylix. Outside, we helped assemble the inner wall of the kiln and the perforated floor as well as the outer wall, made of brick. 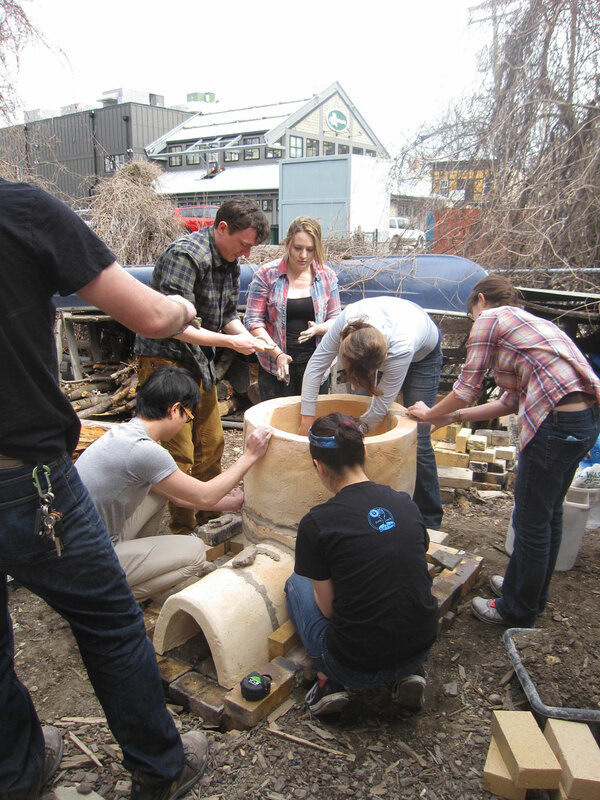 Matt and Cami had already built the foundation of the kiln into the ground behind the studio. There are two channels for airflow running across the bottom of the kiln, one under the firing chamber and one under the fuel chamber. We also filled in the space between the inner and outer walls with dirt, which will act as our insulating material. The parts of the kiln are joined together with wet fire clay, which Matt says will just bake into place as we use the kiln to fire our tiles and kylikes. Unlike our ancient counterparts, we will be using a digital pyrometer to monitor the temperature inside the 18-inch ware chamber. Moisture is an issue going into next week’s firings, as rain is forecasted! Hopefully this will not impact our firing. We will not be using a saggar box, because of the lack of space. This is probably the only area where we are deviating on from Kahn’s and Wissinger’s design. Finishing the decoration of the cups included something that, while not often mentioned, presented an enormous challenge for us: the inscription. The inscriptions on ancient red-figure ware are often done in flat lines with a red-purple color. Unfortunately, we do not know how this color was produced. Professor Balachandran performed an x-ray fluorescence analysis on the inscriptions of the cups in the JHU museum, hoping to find an added element like manganese that would explain the color. However, at the precision that our XRF device is capable of, the inscription material seemed to be the same as the background slip. With those results in mind, my group painted our inscriptions over an already slipped and burnished surface. Only time and firing will tell if they will be visible or will vitrify in the reducing stage and remain black like the rest of the slip. Even if our attempt fails, we will be one step closer to an answer in knowing at least one thing the Greek potters did not do. One thing that really stumped me was the question of how to apply the background slip to the outside of the bowl, the inside, and the background of the image. When we were trying things out, the brush seemed to be out of the question for sure, because it was hard to cover such a large surface evenly. However, Sanchita had the thought of using a rag or cloth dipped in the thin watery slip to apply in large strokes, and it worked very well! I’m not sure how it is going to show up once fired, but as it at least looked like it could have been a possibility. What I really liked about using a cotton pad to apply the slip was that I was able to then use the dry parts of it to attempt burnishing the large outer sides of the dish as well as the inside of the rim. It worked marvelously! It really seemed to be burnishing the slip well! I found that, at least for the smaller sections and the parts closer to the more raised relief and contour lines, that simply trying to burnish with my fingers worked best and offered me the most control. I simply can’t wait to see how all of our efforts show after the firing when everything is said and done! Great post! We also built an extension for the fuel chamber so that more fuel could be fed into the firing chamber. It would also help to insulate the flame inside the firing chamber better from the drizzling rain today. Looking forward to the firing tonight! It was pretty windy outside when we were assembling the kiln. Matt pointed out the direction of the wind, which flowed directly in to the opening at the base. This was an important aspect to consider in the placement of the kiln; by increasing airflow, the conditions inside the kiln are homogenized, and the pots are more evenly fired. Hopefully, tonight we’ll be able to keep the rain out while still letting air in! Additionally, some of the walls of the kiln warped during drying, so they didn’t fit together perfectly. We were able to put the kiln together, but could not get clay into every crevice. This means that there are air bubbles present in the seams, which wouldn’t be a problem in dry weather conditions. Unfortunately, the forecast for tonight is rain, and moist air bubbles can mean explosions. Regardless of the issues that the rain poses, I am looking forward to tonight and the results of the firing! Like Dane, I was surprised by how well a cloth worked for applying slip to the larger sections of the cup, like the background and outside. It wiped on evenly and had enough precision to apply around the contour lines. It was also much much quicker than using a brush, which meant that multiple layers could be applied efficiently, and it burnished well. It also didn’t leave any stroke marks the way a brush would, but it did leave some wiping marks. I’m curious to see if those marks remain after firing, or if the background develops the even sheen we see on the ancient cups. Like Anna, I am really interested in seeing how the different inscription precesses each group employed will turn out after firing. The way I went about inscribing my own tile was by using an evaporated slip that had been mixed with honey, and applied it to the already slipped and burnished clay surface. The thickened slip-honey mixture stayed well on the linierhaar and made a very consistent line. What I found most interesting was that the thickened slip did not dry completely, remaining a dark red-brown color and was still sticky to the touch after sitting out for a while. I’m really looking forward to seeing how this will look after the firing. As one of the exiled apprentices (well, not really) that broke a handle off of my group’s kylix, I am curious to see how the broken handle is manipulated during firing. There is a good chance that the broken fragments will not fit back to the original breaking point on the bowl of the kylix. It will also be easy to compare the fragments to the attached handle. I’ll admit, it was significantly easier to apply slip to the center of the bowl with only one handle to maneuver around. I look forward to repairing our vessel after firing, and approaching the kylix from yet another perspective as a conservator. What I found to be interesting about the experiences last week was the juxtaposition between painting the cups and putting the kiln together. Both required such different kinds of skills. I’d imagine that in ancient times those jobs would be specialized. It’d make it a more social experience! Thanks for the post Hana! My team actually thought the evaporated slip Prof. Balachandran brought in was a bit too thick, so we thinned it out with some of the very thin slip she brought in as well. The relief lines painted in with the highly evaporated slip stood too far of the surface of the cup so that when we attempted to burnish it, it flaked off. Most of the lines were redone with a more diluted slip, but we left some of the lines painted with the thick slip to see how it would fire. We also applied two layers of background slip before burnishing around half of the surface area. We’re looking forward to see if there is in fact a difference between the burnished slip and non-burnished slip in terms of the shine of the final product. Piggybacking off of Savannah’s post, I too, am a member of the broken-Kylix club. Tragically, both handles snapped off of my cup. It was awful. However, it will give us the chance to explore art conservatism. While my group is excited about this chance, I can’t get over the idea of our perfect cup laying all shattered and sad. I’ll just have to comfort myself with the knowledge that even the ancients didn’t have a 100% success rate! Don’t worry Kelly and Savannah! It just goes to show that Greeks would have had to learn how to handle their wares with the utmost care, during all numerous stages of production. I’m sure that even an apprentice back then would have been given some leeway. And I highly look forward to the supplementary lecture on conservatory glue. I had a break of my own – although it was of my own skin, after using a mallet to pound clay. It seems like this class takes a little bit of sacrifice from us all.